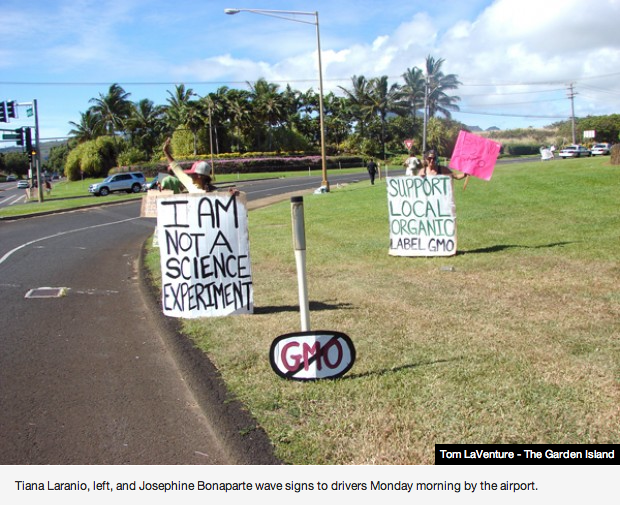 LIHU‘E — Genetically modified organisms were the focus of a worldwide Occupy movement on Monday, and demonstrators in Lihu‘e said Kaua‘i is Ground Zero with experimental seed testing. 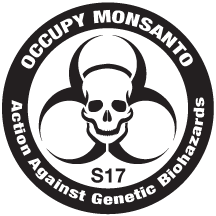 Most of the world was holding an Occupy Monsanto protest, a GMO company that has since departed Kaua‘i, but still has operations in Hawai‘i. The Lihu‘e demonstration focused on all major growers conducting testing, including Kaua‘i companies Syngenta and DuPont/Pioneer, along with ConAgra Foods, Inc. and BASF SE. The issues were about expansion of testing fields from Kekaha to the Eastside, and the referendum to require labeling of GMO products in foods. Kahn fears that poisons in the drinking water and soil is killing microorganisms and bacteria that are beneficial to life. The results of leaching pollution is killing the oceans, reefs and fish, he said. “I am not necessarily against it (GMOs), but the science of it needs to be inspected,” he added. Michael Schultz was demonstrating about the wealth of university research on pesticides and herbicides that damage the land and environment. Fern Holland said she began researching the GMO issue five years ago as a student of environmental science, marine biology and wildlife management. She said studies from the Institute of Responsible Technology shows GMOs are not doing the right thing. 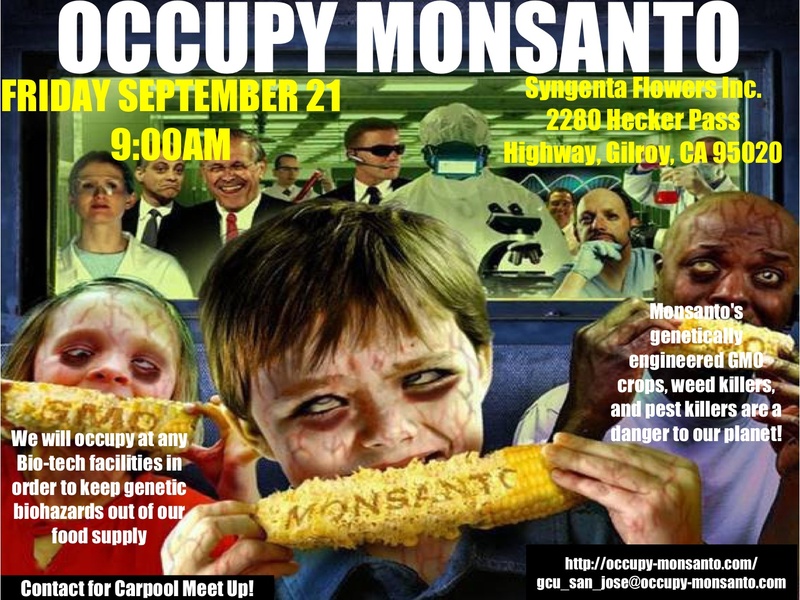 “They are chemical companies that are genetically modifying the world’s food supply to need chemicals,” she said. The GMO issue should unify creationists and evolutionists, who agree that open testing of the world’s food supply is unacceptable. They also believe that breading across species is fundamentally wrong, she said. Only numbers will make a difference, and Holland said that monthly community meeting for people on all sides of the issue will follow. She hopes to get 30,000 people to join the cause. There are currently two lawsuits in state circuit and federal court against seed companies on Kaua‘i. The suits claim that violations of dust suppression orders are poisoning neighboring communities and are preventing organic farms from maintaining its status. “The Hawai‘i Department of Agriculture supports all forms of legitimate agriculture, which includes conventional farming, biotech farming and organic farming,” said Janelle Saneishi, a public information officer for the department. Hawai‘i Board of Agriculture Chairman Russell Kokubun was out of state and not available for comment. Biotech farming is regulated by the U.S. Department of Agriculture, and once it approves a crop for planting, it is considered like any other plant, she said. Research crops must also follow USDA conditions, but once approved for release they are considered a deregulated crop and not experimental, she added. As of now, there does not appear to be scientific evidence of harm, she said. 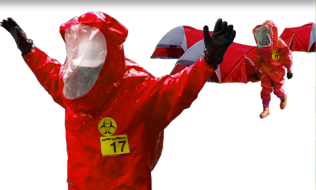 Biotech is regulated by USDA permits including inspections quarantine branch facilities. “We do have some input into how they grow and the inspectors look at how they are following permit conditions and USDA regulations,” she said. Lopaka Baptista said he grows his own garden and wants his family to have good food on the table. The GMOs ruins everything, he said, referring to his brother who suffers from the effects of Agent Orange during the war in Vietnam. He said that Atrizine in the water supply is also deadly for humans, pets, animals and birds of Kaua‘i. Corn, soy and canola are taboo items to Raebeck. She buys only organic tofu and soy milk. Tiana Laranio said she was raised a “GMO youth” on microwavable groceries and canned SPAM, sausage and white rice. She suffered from reproductive and gastrointestinal problems at a young age and said she saw a connection with food allergies. She said Occupy is about self-empowerment through community outreach and education. She said people can learn to read labels and demand that stores sell GMO-free products. Once people know and they choose the alternative, then the natural forces of the free market will make the adjustment. As for Hawai‘i, she would like to see remediation of the ceded lands used for sustainable programs that get more people working with community gardens. As for protesting, this is Laranio’s first time and she was motivated by the sudden growth of GMO fields around the island. Calls to Syngenta were not returned by press time. DuPont Pioneer responded with resources that explain the work of GMOs on Kaua‘i at www.hciaonline.org. More Hawai‘i seed industry surveys and information on biotech food safety is available from the International Food Information Council at www.foodinsight.org.